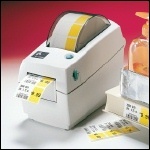 The direct thermal LP 2824 bar code label printer is ideal for retail and other label applications. The LP 2824 redefines the compact printer class. It fits into areas other printers cannot, withstanding rough handling and integrating easily into a wide range of applications. A 5" media roll capacity and clear media window optimize productivity, while a maximum print speed of 4" per second enables fast job processing. Model 2824-21100-0001, 203 DPI, 4 IPS Print Speed, 128KB SRAM, 512KB Flash, Serial, USB, US Plug, EPL Language. Discontinued - Call for replacement. Model 2824-21100-0011, 203 DPI, 4 IPS Print Speed, 256KB SRAM, 1MB Flash, Serial, USB, US Plug, EPL Language, Alt Available. Discontinued - Call for replacement. Model 2824-21100-0021, 203 DPI, 4 IPS Print Speed, 128KB SRAM, 512KB Flash, Serial, USB, Real Time Clock, US Plug, EPL Language. Discontinued - Call for replacement. Model 2824-21101-0001, 203 DPI, 4 IPS Print Speed, 128KB SRAM, 512KB Flash, Dispenser, Serial, USB, US Plug, EPL Language. Discontinued - Call for replacement. Model 2824-21102-0001, 203 DPI, 4 IPS Print Speed, 128KB SRAM, 512KB Flash, Cutter, Serial, USB, US Plug, EPL Language. Discontinued - Call for replacement. Model 2824-21107-0001, 203 DPI, 4 IPS Print Speed, 128KB SRAM, 512KB Flash, Dispenser, Liner free, Serial, USB, US Plug, EPL Language. Discontinued - Call for replacement. Model 2824-21200-0001, 203 DPI, 4 IPS Print Speed, 128KB SRAM, 512KB Flash, Parallel, US Plug, EPL Language. Discontinued - Call for replacement. Model 2824-21201-0001, 203 DPI, 4 IPS Print Speed, 128KB SRAM, 512KB Flash, Dispenser, Parallel, US Plug, EPL Language. Discontinued - Call for replacement. Model 2824-21202-0001, 203 DPI, 4 IPS Print Speed, 128KB SRAM, 512KB Flash, Cutter, Parallel, US Plug, EPL Language. Discontinued - Call for replacement. Model 2824-21207-0001, 203 DPI, 4 IPS Print Speed, 128KB SRAM, 512KB Flash, Dispenser w/ liner-free, Parallel, US Plug, EPL Language. Discontinued - Call for replacement. Model 2824-21400-0001, 203 DPI, 4 IPS Print Speed, 128KB SRAM, 512KB Flash, Serial, 10Base-T Prt Server, US Plug, EPL Language. Discontinued - Call for replacement.